On May 26th 2016, the Tarot Garden‘s oldest guardian: Ugo Celletti, passed away at the age of 87. 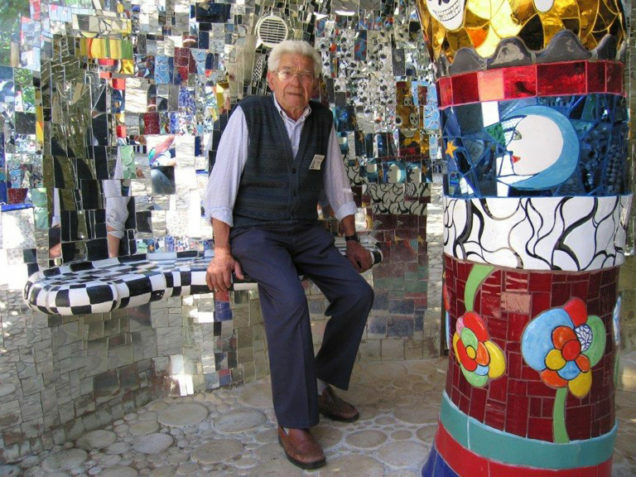 Ugo Celletti was the second crew member helping Niki de Saint Phalle to create her monumental sculpture garden. He started in 1979, at the age of 50 : a postman in his town in the morning, a worker at the Garden by the afternoon. He’d discovered a passion for mosaic work, and adorned many of the sculptures with mirror, glass and customized ceramics. His love for the garden and its visual beauty drove Ugo Celletti to work there for 36 years and to encourage his nephews to join the adventure. Some of his family members are still maintaining the Tarot Garden today. Thank you, Ugo. La Mort n’existe pas. Life is eternal. Watch Ugo Celletti apply glass mosaic to the Empress.